John Straley. Soho Press, 2018. 241 pages. $25.95. Crime and mystery readers will fondly recall Sitka writer John Straley's popular series of Cecil Younger investigations that began in 1992 with "The Woman Who Married a Bear" and seemingly ended five books and nine years later with "Cold Water Burning." Happily, both Straley and Younger are back, and they are in fine form. Not only that, but Soho Press has republished the whole series with striking new matching covers. Investigator Cecil Younger is now fifty-six years old and as flawed as ever, with a history of alcoholism, poor relations with the law, and plain old bad luck. He has a wife and a thirteen-year-old daughter. He is still accompanied by his ward and friend Todd, who "rests comfortably on the solidly affected end of the Asperger's scale." Todd, an endearing character, has taken up both an interest in Buddhism and a hobby of joke telling, which provide much of the leavening in the story. As in the past, the story takes place in a recognizable Sitka, and Younger is compassionate towards his clients, who are often petty criminals beset by addictions and social conditions. As a husband and dad, he finds one of his greatest challenges in dealing with a teen daughter "lost to her cell phone" and in conflict with her mother. As the story begins, Cecil is speaking to judges. "If it please the Court: Your Honors, I stand before you to tell the story of what happened." What happened fills most of the rest of the book, as Cecil describes the sequence of events that got him, and others, into deep trouble. Right off, things are not right with Cecil's world. The rain will not quit, for one thing, and a mudslide the year before had killed three people. There'd been hardly any snow for two winters, and fishermen were catching tuna in warming waters. A young mother was missing and presumed dead. Cecil tells the judges, "I like to think that on that first morning I knew everything was about to go sideways." Readers will see that Cecil is a truthful and generally well-meaning man who made a whole series of very bad choices and decisions. Some of these are inexplicably bad and may cause readers to wonder about Cecil's overall judgment and mental health. Certainly he illustrates the cascading effect of one bad choice leading to another and another as he seeks to "fix" earlier mistakes. The action driven by all this keeps the story moving along briskly. Cecil is an acute observer, and many of Straley's descriptive passages are close to poetry. In Sitka, in the September being spoken of, "The rain was falling like BBs on our shoulders as we made our way past the Russian cathedral in the middle of town, and a raven sat perched on the lip of a black garbage can laughing at us as we passed." Before recently retiring, Straley himself spent thirty years as a criminal defense investigator in Sitka. His considerable experience with the downtrodden and criminal class is on display here, along with his expertise involving the legal and judicial systems. When one of Cecil's "frequent flyer" clients stops in, they discuss "motions on your stop." Cecil comments to the judges (and reading audience), "The best way to beat a drunk driving case is to file a motion saying that the original stop of the vehicle by the police was unwarranted or illegal. To drunk drivers, the law on illegal stops is like the Magna Carta, right behind the sacred second amendment right to carry weapons at all times." While readers will find sympathetic characters and laugh-out-loud humor in "Baby's First Felony," there is also a disturbing darkness to this violence-fueled story. Several gruesome murders fill the pages, along with episodes of kidnapping, child sexual abuse, dismembering, police corruption, drug manufacturing and trafficking, the use of explosives, and general mayhem. 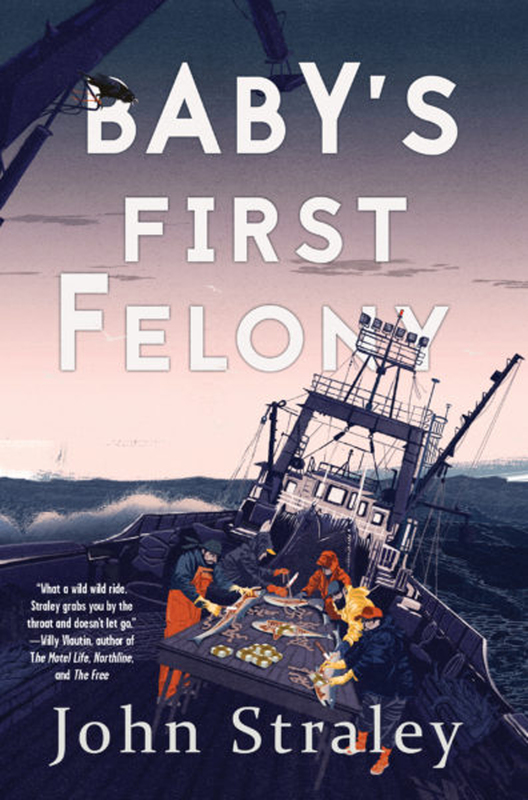 The intriguing title, "Baby's First Felony," we learn, comes from a self-help book that Cecil's public-defender boss is putting together for "intellectually challenged criminals . . . based on first-hand experience we'd had with our clients." Among the book's advice is "not speaking pig Latin to the girlfriend you are trying to talk into building a bomb over the prison phone." And, speaking to police, avoid the phrase "just how stupid do you think I am?" And, when you go to court, do not wear the sneakers you're accused of stealing, with the owner's name written inside them. During the gap between Cecil Younger novels, Straley was not an idle writer. He is also the author of the poetry collection "The Rising and the Rain," four books of haiku (one for each season), parts of a nonfiction book about Ed "Doc" Ricketts (a pioneer in intertidal ecology), and the novels "Cold Storage Alaska" (the first in what is to be a new crime series) and "The Big Both Ways." One of Alaska's most accomplished and admired writers, he also served as Alaska's Writer Laureate from 2006-2008.